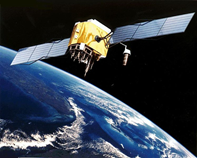 Global Positioning Satellite (GPS) enable your land based co-ordinates to be calculated by communication between a GPS receiver and orbiting satellites. Your position can be calculated anywhere on the planet to an accuracy of a few metres. Image courtesy of NASA. Wikimedia Commons. Apps are now available for your smartphone that can locate you on a map. They are not all the same, and have severe limitations! Aside from showing the co-ordinates of your position, GPS units can track your movements.